Chase Potter (CP): I began playing music at the age of four when I started taking violin lessons at that age. When I was three years old, I vividly remember seeing an orchestra on PBS and I was absolutely infatuated with the violin section. I began relentlessly asking my parents if I could play the violin, and after me asking them at least once a day for an entire year if I could play, they finally gave in and started me with lessons. I began to mess around with jazz between the ages of 9 and 10. My dad plays piano and has always been into jazz, so he would have me learn the melodies to old standards and then I would attempt to solo over the chord changes. Once I turned 12 though, I had started playing saxophone in middle school band and also began taking private saxophone lessons with Jay Miglia as well. Aside from teaching me saxophone, Jay also taught me the fundamentals of jazz, which is when I started to get a lot more serious about pursuing the genre further. CP: One of my main influences for jazz violin is Christian Howes. Christian is one of the first jazz violinists I had ever seen perform live when I was young and it had a very profound effect on me. Years later, he ended up being one of my private instructors and I have also attended and worked at many of his string camps called the Creative Strings Workshop. To this day, Christian’s virtuosity and command over the instrument and the raw energy that he puts into each performance is absolutely incredible for me to watch and is still one of my biggest influences. CP: I have many fond musical memories, but the last great one that comes to mind is back in May when I played my senior recital at Berklee College of Music. I had some very close friends on that show who also happen to be some of the best musicians I have ever worked with in my life. All of us agreed that the magic was really there that night for our performance, and it was also very special for me to bring four years there to a close in a way such as that. CP: I honestly haven’t been listening to too much jazz recently, but I have been really digging Elliott Smith, who was an incredible singer/songwriter from the mid 90’s-early 2000’s who unfortunately died too soon. A lot of other jazz musicians are really into him and he worked closely with some really heavy hitters, having played with Brad Mehldau and having strings arrangements done by pianist Shelly Berg on one of his albums. I have also been really into Unknown Mortal Orchestra, which is a weird lo-fi psychedelic rock R&B group. I highly recommend their new album entitled Multi-Love. CP: The Columbus jazz scene feels like a very close community to me. Almost all of the Columbus jazz musicians have played with each other at some point or have at least heard of one another, which is incredibly nice. It’s so different being compared to my time at Berklee where I had just spent four years, which though it was an incredible experience, had a lot of ridiculously talented musicians that many of us just didn’t know of because they were either under the radar or in different social circles. With the Columbus scene though, on top of us all knowing about each other, everyone is very nice and supportive of one another and there really aren’t that many ego issues at all which is something that can unfortunately be the case in some scenes. What are you working on these days? Any new projects, exciting shows or releases? CP: I’ve been playing with lots of different bands and projects since being back in Columbus. Currently, I’m playing violin in the jam band Raw Dough, violin (and sometimes bass) in the gargantuan sized funk band Safety Squad, guitar for Chuck Starr and The Problem, and also fronting my own band where I play guitar and sing my original songs that goes under my own name. My newest project will be happening very soon actually. I will be flying in two of my very close friends from Berklee to join me and local keyboardist Danny Bauer in three shows during Columbus Day week. On drums will be Hayden Hamilton, who is one of the most incredible drummers I have ever heard in my life. Hayden comes from a very prestigious lineage of drummers including himself who all attended the Houston School for the Performing and Visual Arts, with names such as Chris Dave, Jamire Williams, Kendrick Scott, and Eric Harland. Other musicians who have attended that school include Beyonce, Robert Glasper, and Jason Moran. 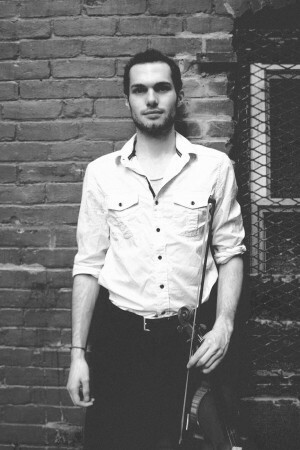 On bass will be Evan Hall, who is an amazing upright and electric bassist from Martha’s Vineyard, MA. On top of being an accomplished bassist, Evan is also an incredible poet and rap artist. He has showcased all of these talents in his band Young Turtle and The Insights where he raps and plays bass at the same time, even opening up for artists such as Lauryn Hill. CP: With the project mentioned above, we have three gigs lined up! For more details, visit chasepottermusic.com.